The Curiosity Rover started this year with some remarkable images of small tube-like structures on Mars. The images were aquired with the Mahli (Mars Hand Lens Imager) camera on Sol 1922 and 1923 (January 01 and 02 2018). The structures are only 1 to 5 mm long and was first spotted on December 15 2017. The rover later returned to the site to investigate further. It didn’t take long before the possibility of trace fossils were put on the table. Wether the origin of these odd features are the result of geological or biological processes is something that may not be answered with the technology we have on Mars today. At the moment most experts lean towards a geological process, and beeing on Mars that is probably a safe bet. I have been experimenting with making 3D models from the Curiosity images lately, and gave this one a shot. It didn’t come out too bad. 11 images aquired on Sol 1923 were used for the model. No pre-processing have been done. The 11 images were loaded into a professional photogrammetry software using structure from motion to generate the point cloud. All images were then used to generate the texture for the 3d model. 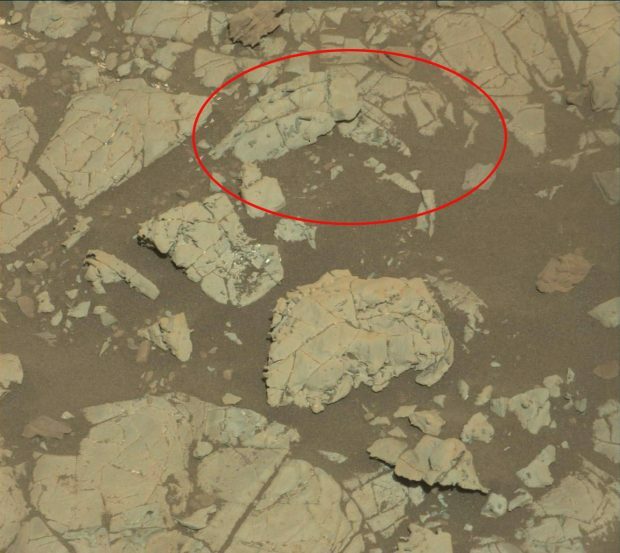 Image taken on Dec. 15, 2017 with the Curiosity Mastcam right camera with the area of interest in the red cirle.